This collection includes the archives of the Newcastle Trades Hall and affiliated Trade Unions, which date from the 1870s. This collection includes the archives of the Newcastle Trades Hall and affiliated Trade Unions, which date from the 1870s. By 1880 Newcastle had become "the very hotbed of radicalism and ultra-democratic notions", and the poet Kendall was forced to withdraw his libellous poem about an early labour politician, Ninian Melville. These records go back to those times when Trade Unions and the Newcastle Eight Hour Committee met in the local hotels, before the opening of the first Newcastle Trades Hall, (at the corner of Hunter and Union Streets), in the 1890s. A6534-A6536 Hunter Valley collieries, industrial relations papers, 1940 - 1969. A6657 Conferences, workshops and seminars, 1972 - 1986; Submissions, reports and parliamentary documents, 1983 - 1986. A6660-A6662 Arbitration and conciliation, awards and agreements, 1928 - 1983. 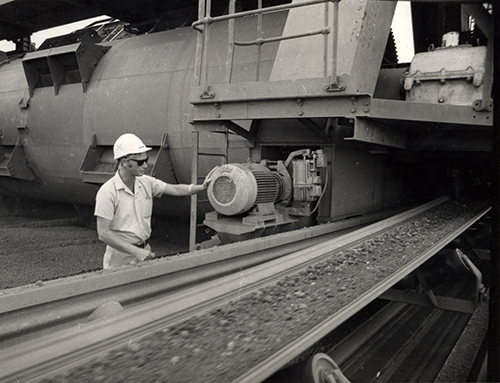 A6662 Kooragang bulk facilities construction agreement, 1982. A6663 Shipwrights Association records, 1966 - 1985. A6664 Maritime Services Board files, 1980 - 1985. A6665 Report of the working party on the Australian ship repair industry, 1984; State Dockyard minutes, press clippings, photographs and reports, 1977; Coal and coal loaders files, 1976 - 1982; Country, Gosford and North Coast correspondence, 1972 - 1976; Industrial Relations Bureau and Industrial Registrar's correspondence, 1972 - 1977. A6666 Printed material: The Kemira stay-in strike, October 1982; Journals, newsletters and printed material, 1980 - 1988; Tape recording: Excerpts from speeches at National Defense Meeting, 1979. Mining records, 1903 - 1918 and press clipping, 1977. A5422 awards relating to Pelaw Main colliery, Proceedings of The Royal Commission on Coal Mining Disputes in Newcastle and Gunnedah 1907, Coal Board Orders and Judges notes 1918, and a press clipping Wallace Maher - fifty years later', by Jim Comerford, 1977. A5694-A5695 Press clippings on colliery industrial disputes, late 1920s; Records concerning National Parks in the Hunter-Manning Region, 1940s - 1950s. AB5579-AB5583 Minute books and journals, 1918 - 1936. A5143 Press clipping book, 1936 - 1944; Cash book, 1922; Employment returns, 1912 - 1941; Conciliation and arbitration files, 1960 - 1969; Essay on boilermakers by G. Robinson, 1976. Sub-Committee on Work Experience, minutes, 1981; Correspondence, 1979 - 1983; Lists of officers and professional members, 1982; Library Association of Australia National Continuing Education Programme prospectus, 1983; Copyright statement on non-book materials, 1982; Posters and brochures, 1982. Newspaper cutting books and papers, 1926 - 1953. Newcastle unions, industrial disputes and Newcastle industries. News cuttings and other papers relating to the Labor Party, social problems and prison work. A5233 Photographs of housing in Newcastle, reflecting poor housing conditions during the 1930s Depression. B10368 Industrial group activity in the Newcastle region with particular reference to the Federated Ironworkers' Association, Miners' Federation, and Trades Hall Council, 1981. A5178-A5183 Play scripts, minute book, set and costume designs, and related printed material. B7967-B7987 Minute books, roll and address book, asylum and maternity hospital admission and discharge books, outdoor relief journal, annual reports, visitors book, and press clipping book. A5749-A5753a, A5935-A5937 May Day, Trades Hall, trade union, and social research records; incomplete runs of labor newspapers, and records on the labor movement collected by unionists Edwin J. Brent and Alex. Dowling, c.1918 - 1981. A5129 Delegates Council attendance sheets, 1956, 1958, 1959; Bank pass books, c.1930 - c.1950. B5654 reports, and related papers. Womens Committee correspondence and related papers, 1963 - 1968. A5134-A5136, A5144-A5147, B5623-B5624 Minute books, correspondence, annual accounts, and related papers.